Tony Shuff is a busy man, and his Oct. 5 heart attack was not on the fall “to-do” list. The 64-year-old small-business owner and director of the Logan and Mason County Salvation Army received life-saving care at Memorial Medical Center and then started cardiac rehabilitation at Abraham Lincoln Memorial Hospital. Shuff is nearing the halfway point of a 12-week rehabilitation program. He does one-hour workouts on five or six machines three times a week. He has already noticed a change in his strength and endurance, and his resting heart rate is adjusting to a more normal level as well. 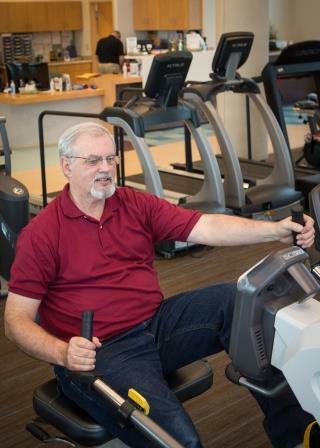 The convenience of the hospital’s local rehab program is not lost on him. Want to help ring the bells with Tony or make a donation to the Salvation Army this holiday season? Call 217-732-7890 and leave a voice mail. Tony will be sure to call you back. 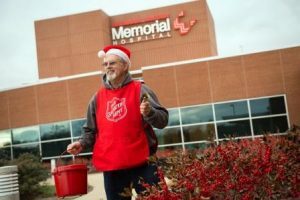 “This community has a heart for the kettles,” he said.